Intel’s 6th-gen Core processors are set to launch later this year, and while the new “Skylake” processors will be 14nm chips just like the current 5th-gen “Broadwell” processors, Intel is introducing a new microarchitecture which should offer reduced power consumption, better performance, and a big boost in graphics performance. In fact, Skylake chips could offer up to 50 percent better gaming graphics than Broadwell chips. Up to 30 percent longer battery life (If a device got up to 8.5 hours of run time with a Broadwell chip, the same hardware should last for over 11 hours with a Skylake chip). Intel says the new chips will feature enhanced audio processing technology, improved touch sensor technology, support for Cat6 LTE, WiDi 6.0, Bluetooth 4.1, eMMC 5.0, SDXC 3.0, and more. Not every chip in the Skylake lineup is created equal. THer will be S-series desktop chips, H-series processors for powerful laptops, U-series chips for lower-power models, and Y-Series “Core M” processors for low-power, possibly fanless notebooks, tablets, and other devices. The Intel Core M Skylake chips should be quite a bit more powerful than their Core M Broadwell predecessors. Intel is promising up to 17 percent more CPU power, up to 41 percent faster graphics, and up to 1.4 hours of additional battery life (when playing full HD video on a system with a 35 Whr battery). You can find more details at Fanless Tech. Man, if the whole 50% better GPU is true, AMD APU are screw. The only advantage they have is gone. I can agree that Intel has turned things around in terms of performance, but Intel still needs to turn things around in price. When the eDRAM iGPUs have a $100 price premium over the non eDRAM iGPUs that is a problem. 72 is 50% more than 48… so you will only get a 50% speed increase if you buy the most expensive Skylake iGPU and compare that to Broadwell GT3 iGPUs. Well if a Skylake chip with 16 EUs can significantly outperform a Broadwell chip with 16 EUs, same with 48 and so on, then those are the benchmarks I’ll be looking for. And maybe I’ll try to buy a laptop with the full GT4e 72 EUs. Fingers crossed for 100% HEVC hardware decoding. It doesnt really say anything. 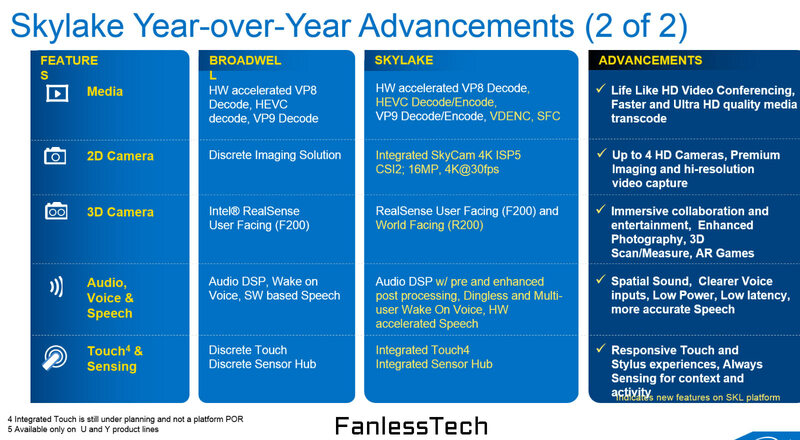 It suggests that Broadwell and Skylake both have “HW accelerated HEVC decode”, it doesnt distinguish them. It kindof implies that they have the same thing. I don’t know. I’m interpreting that differently than you are. When they say they add encoding support, I don’t think that has anything to do with decoding. Transcoding doesnt really sounds like it has anything to do with playback, or decoding. You sure this is legit? Broadwell is spelt wrong and I’m pretty sure it supports PCI-E 3 unless they downgraded over Haswell. If it was from some two bit Chinese chip manufacturer you’d kinda expect errors but Intel don’t usually make these kind of mistakes. the last L just got moved to the next line. Intel’s presentation decks from the past have always been pretty shoddy. The PCIE Support is likely referring to the U and Y series… Things like eMMC support are only for the more mobile product range that you’d see put into some tablets, etc. and relies more on the native support of the platform rather than what the motherboard chipset can support…. Guess we have to wait till Zen comes out with their HBM FX APU’s. These are good for games that were out before 2010. Still mid to high end dGPU from 2010 are still better than today’s iGPU/APU for gaming any day.